In our family, anything that can be done in one dish and in less than 30 minutes wins. So when I was debating over one of several zucchini recipes or the Zesty Ravioli Skillet, Zoe voted for the Zesty Ravioli Skillet. She has been craving Italian and Mexican foods lately, so this was perfect and it met one of my criteria – it has green vegetables (spinach). It is only fitting that the Z in my life got to pick the Z recipe for this last blog of the alphabet. I have known I can cook pasta in fluids like water and broth, but this will be my first time to cook ravioli in the juices of the diced tomato’s. I can only imagine how much of the tomato flavor is going to get absorbed into the pasta as it cooks in the pan. It reminds me of how we absorb so much of the energy and ideas we have from other people. I would like to think that those who soak me up are absorbing love, light, and positive energy. Growing up pies, were one of the many baked goods my mother excelled at. Although she was much better at her cakes and pastries like rugelach. I can still close my eyes and smell those aromas floating through the house. When she made her pies she always made her own dough and had her own secrets about making pie crust, which are no longer secrets, but that will be another blog. What I do remember, however, is that all her pie crusts looked the same. She always went around and made little pinches with her fingers. I wonder what she would think of some of the creative ways Pampered Chef has come up with to decorate pie crusts and tops. This X marked pie crust is just one of them. It is quick, easy and creative. All you do is press the dough into your pie pan, trim off the excess, and then use the releasing end of the Cake Tester and Releasing tool to make X marks on your dough. If you then brush the crust with beaten egg, using the Chef’s Silicone Basting Brush, it will enhance the details and make the X pop. You already know why I like the Chef’s Silicone Basting Brush, but the Cake Tester and Releaser is not only a baker’s dream, it also represents some spiritual lessons for me. this tool not only can check to make sure something is done, but it can also help to release the baked goods from your pan. I have known folks who use it to piece potatoes and those who used to bring them out at fondue parties to dip fruit into melted chocolate. Of course, that was before we came out with our S’more and Fondue Stick Set. One of my wife’s favorite foods is a waffle. Until recently, one of the wisest investments we made was in the waffle iron we bought. It is one of those waffle makers that takes all the guesswork out of making waffles. The only challenge was the first batch getting them to the proper level of crispness for my boo. That accomplished, which for her was between a 4 and a 5, the rest was a cakewalk. You plug it in and it beeps when it is properly heated. Put in the batter and close the lid and it beeps when your waffle is done. Perfectly prepared waffles every time. The main problem I have is that sometimes I put a bit too much batter in and then it overflows and I have to clean up the overflow once her waffle is done. Life, like a waffle does not always go smoothly or seem to come out perfectly. Watching my wife drool and moan as she dreamingly devoured two buttermilk waffles smothered in melted butter and syrup, she asked me if I was going to have one. No. don’t get me wrong, waffles can be awesome. And every once in a while, I can have a waffle the way she likes them, but most times, if I am going to have a waffle, I have to do something to it. Like one day, I added blueberries and ricotta cheese to my waffle batter. Oh my, those were so good. Especially when I would come to this little pocket of ricotta cheese and then a blueberry. It was almost like eating a cross between a blintz and a waffle. But my favorite way to eat a waffle is with some shredded cheddar cheese and some salsa mixed into the batter. So it is kind of like this quesadilla waffle. Sometimes I will hold the salsa, just add some taco meat, cheese, diced jalapenos, onions, and tomatoes to the batter, and then put salsa on top, kind of like the syrup. There really is no right way to eat a waffle. When I was a kid we would play a game to build our vocabulary. I remember V being for vegetables and victory and a few other words. It was fun to be able to say that V is for V shaped. I love the shape of our V-Shaped Baking Pan Set for a few reasons. One being that it helps me make healthy snacks for my family, which is a challenge. It is going to also be making one of what Zoe calls junk food night, “taco night” fresher and easier. I can even use it to make some fresh and easy to make desserts. With my busy schedule, anything which can make my life easier and help me get fresh and healthy food on the table is a blessing. My wife is a chip addict. So I love that in minutes I can make her fresh potato chips and if I am feeling risky, I can try getting her to eat some homemade fruit and vegetable chips. What I love about this new set is that it lets me bake twice as many ships as I could on a sheet pan. So now I can make tortilla and potato chips on demand, well with some notice at least. LOL As long as I have potatoes and tortillas in the house I can make chips. What I am looking forward to trying next is making dessert tacos with pie crust and my favorite fillings. The more I look at these pans, the more I realize that what I can create with this pan is limited by my own imagination. Three Onion Rub is more than a few of my customer’s favorite rubs and is a staple in their homes. Besides which, at $6 a bottle, it is easily affordable. So it was easy to pick this product as one of the many products we carry starting with a T.
What many people do not know is that our pantry products are exclusive eto the Pampered Chef and designed in our Test Kitchens at our Home Office. It is a blend of red onion, yellow onion, and onion powder. Three kinds of onions which live harmoniously in one bottle, each bringing their unique flavors and gifts to the table. Not only that but if you somehow run out of onions, which I have managed to do, you can use three tablespoons of Three Onion Rub to replace one medium onion. Did you know that our tasty spice rubs & blends are kosher & gluten free?What I love most is the simple lesson it teaches me. If we allow ourselves to open ourselves up we can be like any one of the three onions and work together in perfect harmony. It is a reminder that a diverse group of people (onions) can come together to create something even greater then themselves. We each have a purpose in life. However, we also have the opportunity to work together with others to make this world a better place. Our Three Onion rub can do that to your food and we can do that as human beings. This week has been crazy and I have been struggling to pick a product that begin with an S. Then I found myself craving spaghetti and meatballs, vegan for us of course. I have always loved eating spaghetti ever since I was a child. Well actually it was Spaghettio’s until I discovered real spaghetti with amazing sauce, but that is another story. My wife, however, enjoys when I make spaghetti with homemade Pomodorro Sauce and vegan meatballs. There is something comforting for people about spaghetti and meatballs. The thing about spaghetti I have found most interesting is that there is more to its history then I knew. When I think spaghetti, I think Italian and my guess is that most people do. However, it seems that the development of pasta, spaghetti in particular, has its roots in Chinese and Arabic cooking. Maybe that is why I enjoy lo mein so much. It reminds me of eating spaghetti, but without the sauce, which I never liked growing up, until I learned how it should be made, and with the vegetables, which I enjoy. Or why some of my favorite Middle Eastern dishes use some sort of pasta as a main ingredient, like lentils and pasta or a myriad of kugels. While we may associate spaghetti with Italian cuisine today, it has its roots in earlier civilizations and times. One of the things I like about spaghetti is what its appearance on the plate teaches me about life. If you look at a plate of spaghetti, nothing is laid out in a clear distinct linear pattern. Rather, the noodles are interwoven, interacting with each other, and overlapping each other. The movement of one noodle affects the position of others. This plate of noodles reminds me so much of life. We are all like noodles, interwoven and intermingling on a plate. We may not always even realize we are somehow connected until a certain string of spaghetti is moved and we discover something shifting in our own lives. If you have not ever tried or heard about our amazing Rockcrok, then buckle up, you are about to learn about a set of cookware which will change the way you think about cookware. It’s like the moment you learned something spiritually which totally changed the way you walk your spiritual journey. One of the most amazing things about our Rockcrok’s is that they go everywhere. They can be used on the stove, in the oven, in the microwave, under the broiler and even on the grill since they can hold up to 752 degrees of heat. With the slow cooker stand, you can also slow cook in it. You can start on one heat source and move to another. They can also be stored in the refrigerator and freezer and are also dishwasher safe. They also come in just about any size you can imagine like the casserole dish which is perfect for the side dish or a main dish for two to the Dutch Oven XL which hold 8 quarts. It is much lighter then heavy cast iron, but has the even heat distribution cast iron has. It has high heat retention and will keep your food warm until everyone is done eating. The list of what you can do with this cookware can be hard to believe because in addition to all of the above you can use metal utensils while cooking in it and it is dishwasher safe. This seems to be true of life in general as well. I and several of my friends have been through some high pressure situations in our lives recently. What we have all shared with each other is that the pressure has helped each of us to become more spiritual, faithful, and compassionate. We have learned to focus our energies on those things which matter the most, not on things that would further drain us of our energy. The Quick Cooker has 16 different functions and a 6 quart capacity. It can solve the problem when you have forgotten to defrost whatever protein was on the dinner menu. It can bake bread, steam hard boiled eggs, and like some superhero seem to bring amazing and flavorful meals together in no time, like in a single bound. 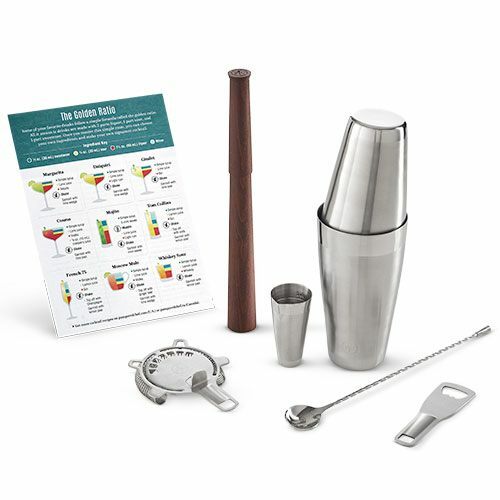 Unlike O, we have a slew of products which begin with P. However, after asking about 20 people whether I should reflect on our Pastry Blender or our Premium Cocktail Set at 10 AM, the overwhelming response was the Premium Cocktail Set. Not sure what that says about me and some of my FB friends. That may be another week’s reflection after I I finish blogging my way through the alphabet. The funny thing is that I am not much of a drinker anymore, mostly because they did not mix well with all my medications. I am also not much of a baker anymore. The P product which probably gets the most use is the Personal Size Round Stone and the Pizza Cutter, which is how we cut carbs in our household (LOL). What made me select this item to reflect on is that Pampered Chef has tried to think of everything in putting this set together. They thought of all the tools one would need to make fresh cocktails and mocktails at home. There is everything one could ever think of and then some, including recipes, to make measure, shake, and pour any cocktail. I love the fact that everything I need is all in one set. How awesome would it be if everything we needed to make it through life came in one set. I have one friend who would tell me that everything she needs comes in the Bible and in her personal relationship with Jesus. I have another who tells me that it is the Buddhist teachings and writings which give her all the tools she needs to make it through daily life. At the ripe age of almost 63 (June will be here soon), I have realized that I do not have a Premium Faith Set. The set I have is constantly changing and evolving. I am taking tools out and putting new tools to use. So having a complete set would be amazing. In thinking about what to write about this week I had a choice of products beginning with Large, one with Layer and one with Lemon (Lemon Pepper Rub). As I thought about it, I realized that layers was the perfect choice as we are all layered in various ways. This week, I am going to focus on the Layer Cake Pan Set. One of the things I like about these cake pans is that they have a fill line inside the pan to act as a guide for batter so your cakes don’t bake over the rim. It also keeps each layer coming out the same depth, so when you slice into them later, each layer of your cake is the same depth. Having these even layers in my cakes has left my friends wondering if the cake was made by me or a professional. Did I make this myself or buy it from the local bakery? These fill lines make me wonder what the world would be like if each layer of our world was filled to the same level. If we valued each group of people equally. As I tell my students it is not that difference is problematic, but not valuing those groups equally which becomes problematic. When these were discontinued a few years ago, I had several customers who were disappointed. When they came back, in new colors this year, I knew they would be flying off the shelves and I was right. However, this is not why I wanted to write about them this week. Paring knives are perhaps one of the versatile knives. 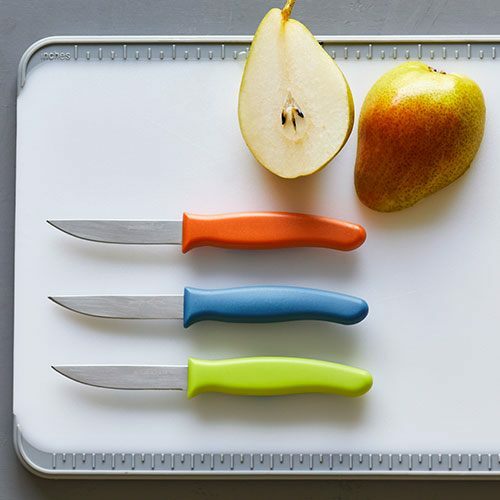 They are often one of the most frequently used knives in a chef’s kitchen. They can be used for peeling and chopping a wide assortment of fruits and vegetables. Each of us has some sort of spiritual paring knife we use on a daily basis to help peel and chop our way through the situations, which life brings us each day. However, the reason I wanted to write about them is they are our Round Up from the Heart product. Each season Pampered Chef features one product, the sale of which contributes to Feeding America. Feeding America is the nation’s largest domestic hunger relief organization. Through the partnership between the two organization, more than $25 million dollars has been raised since 1991. These funds go to feed the more than 40 million American, a significant number of which are children, who do not know where their next meal is coming from. I had a few choices for products starting with J this week, but had to go with the Jar Opener. I don’t know about anyone else, but there are way too many times in my life when I have had trouble opening the lid on the jar. It doesn’t matter if I have opened it before or not. Sometimes, someone follows behind me and closes the jar so tightly that I have to ask them to reopen it for me. Granted my hand strength is not what it used to be when I was younger, but even then, I sometimes struggled to get the lid off. 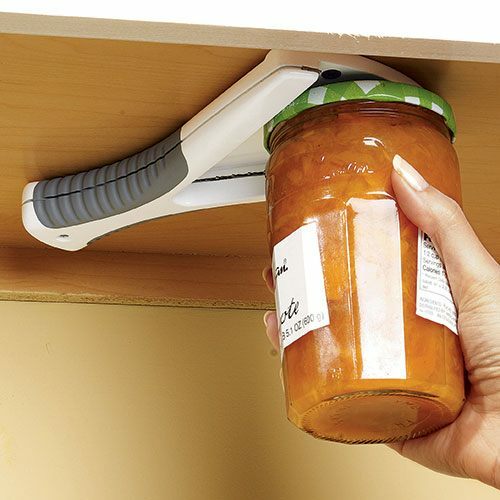 One of the things I love most about this product is that I can mount it under my kitchen cabinet or I can use it by hand. The hand is soft, comfortable, and easy to use. Every time I use the Jar Opener, I remember how my faith helps me open up my belief system and explore my beliefs, some of which are outdated and need to be taken out of my jar. Some items need to be taken out of my jar and sometimes items need to be put in. One of the things that I love about this bottle is that regardless of whether you are a person who likes to sip what they are drinking (like my wife) or chug (like me), this bottle works for everyone. The strainer, which comes with the bottle, allows you to position what you are infusing in ways that do not interfere with your drinking, whether you are a sipper or a chugger. If you are a sipper, the fruit or herbs you are infusing go below the strainer. If you are a chugger, then that which you are infusing goes above the strainer. The idea is that regardless of how you choose to drink your beverages, this water bottle works for you. Using fresh herbs is something so many of my guests and hosts tell me they are afraid of. I can understand that to some degree. Even though we know fresh is always better than processed, we tend to not be familiar with them and so go for what we are familiar with. There is also the fear of how to properly handle them and mince them for recipes which call for them. Having the right tool is always important. I love the herb mill for a few reasons. First it enables me to mince herbs without bruising or crushing them. Like herbs, we as human beings can be fragile at times. There are times we have to go through transformations in our own lives. However, where possible we would prefer to go through these changes in a way that did not cause us any additional harm. The Herb Mill is a fast way to add fresh flavor to your favorite recipes. It’s a quick and safe way to mince herbs, both soft and hard. The ceramic ball in the mill gently pushes the herbs into the blades without causing them any harm. The container also has a lid which allows you to store the herbs in the refrigerator after being minced. A friend of mine gives me a hard time about my ability to see life and spiritual lessons in just about everything. As I was thinking about our Grilling Tool Set, I thought how awesome it would be if I could store all my spiritual tools in one place. Many of them are stored within me, but others have found their home in meditation room which contains my books, music, a futon for friends and clients to sit on and my altar which contains all the things which help bring me peace and ground my environment. Yet I do not have a way to put all of them in a tote and bring them with me. 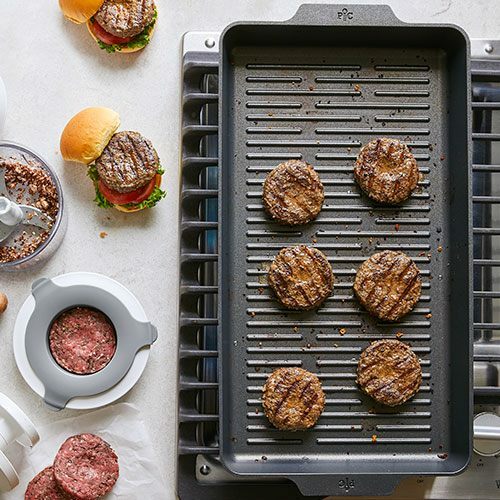 Our Grilling Tool Set allows those who enjoy grilling to tote their tools, cook, and clean up without the stress of wondering if they have all the tools they need. 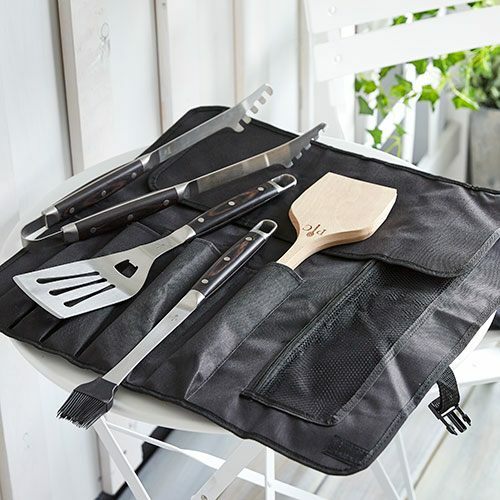 The set includes Grill Tongs, Grill Spatula, Grill Basting Brush, Wooden Grill Scraper, and of course the Grilling Tool Bag. Each piece plays its own role, including the Grilling Tool Bag. When you first look at, it appears like a fairly simplistic bag. However, as you explore it you begin to see that there is a functionality to the bag that transcends carrying tools. It has five pockets to carry the grilling essentials. However, it also has a mesh pocket where you can store other things you might need, such as spices, silverware and a thermometer to check the temperature of the meet you are grilling. One of the qualities I love is that it is machine washable. During the process of grilling, the tools can get dirty and there is not always a place to wash them before having to repack them, so being able to wash the Grilling Tool Bag once you get back home is a blessing. We all need safe places to store our tools, however, it is also nice to know we can easily keep them clean. I love each of the tools for different reasons. Each of the tools is at least 16 ¼” in length. The length helps each tool do what it is supposed to do while keeping your hands away from the heat. There are tools I have in my spiritual toolbox which have helped me turn situations, or at least my perception of them around, so I did not cause myself or others any harm.